We are very pleased to announce our latest collaboration! Over Easter weekend (Good Friday, Saturday and Easter Sunday) BnT will be serving barista coffees, teas, sweet and savoury snacks alongside his fantastic twisted cordial ‘kreations’! Please note that the pop-up café is NOT a permanent café, therefore please do not come on other dates expecting it to be available. Join us for an afternoon of creativity for well-being with the wonderful Surrey Art School and GLO YOGA. In the grounds of the sculpture garden we’ll be taking a moment to connect to nature, slowing things down with a mixture of mindful creativity and Yoga in this beautiful, peaceful location. "The body is the garden of the soul..."
Nature inspired Yoga with GLO YOGA - Be like a tree, bend in the wind and find your feet with a grounding and gentle yoga practice led by the lovely Georgie. Mindful Mono-printing workshop with SAS founder Ellie Green - we''ll be collecting fallen leaves and working with fragrent herbs, flowers and ferns - creating stunning, almost photographic prints using eco friendly, non toxic, vegetable oil based inks. Take a moment with us just to reflect and connect to the beauty of the present moment in this stunning secret garden. How to book: Yoga and Art workshops are suitable for absolute beginners. Ticket price includes FREE entry to the garden and you are welcome to take a wander before or after the workshop. Full Booking terms and conditions are here. An Afternoon in the Garden…. Booking is through Surrey Art School only - please click here to be taken to their events page. If you have any questions about this event, please contact Surrey Art School: surreyartschool@gmail.com. 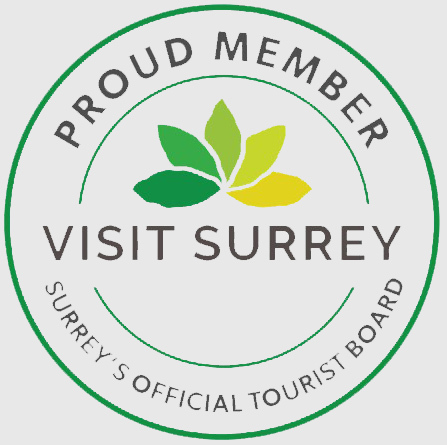 Surrey based open-fire catering, pop-up events & cookery courses. Lovers of all things cured, smoked & pickled. After the roaring success of 2018's partnership, we are thrilled to be hosting The Salt Box again this year. 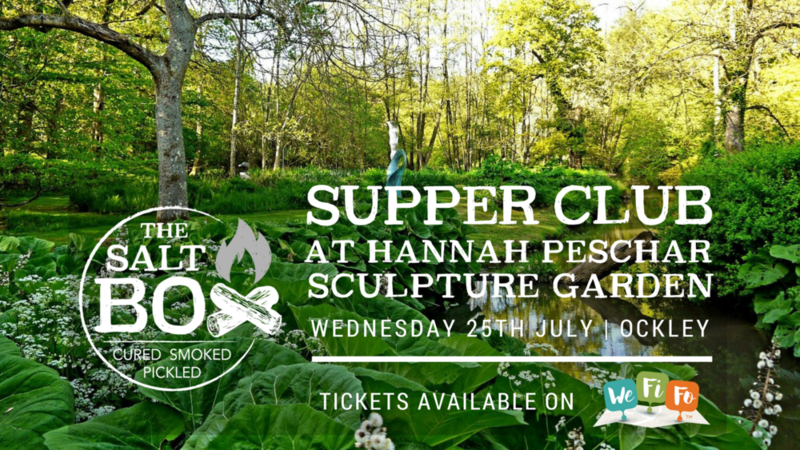 Make the most of the summer evenings and join us for a unique dining pop up experience at the Hannah Peschar Sculpture Garden. The evening will kick off at 6:30pm with an aperitif, followed by a number of light bites enjoyed at various locations hidden amongst the trees within the Garden. Before we sit down for the main event, you’ll have the chance to explore the garden at your own leisure. For main course and dessert, you’ll join us on the lawn in the heart of the Garden, on our family-style sharing table for an open-air feast cooked over fire. We hope to host another Salt Box event later in the summer, so please sign up to our mailing list to be notified when tickets are available. They sell out fast! The nights are drawing in, the leaves are turning, and there are just a few weeks to go until we close for the winter break. It has been the most incredible year - the weather was quite astonishing (A proper summer! Who knew?!) and we have been blessed with masses of wonderful visitors from near and far. This year’s collection was very special indeed, and we will be sad to see a number of amazing pieces leave us in November. BUT, never fear - plans are afoot for an even bigger exhibition next year! New artists, new ideas, and new landscape art created by us here at the Sculpture Garden. Let’s hope 2019 is even better than this year! Teas, cold drinks and delicious cakes available Saturday to Monday over the Bank Holiday. Make the most of the summer evenings and join us for a unique dining pop up experience at The Hannah Peschar Sculpture Garden, presented by The Salt Box. The evening will kick off at 6:30pm with a cocktail aperitif, followed by a number of light bites enjoyed at various locations hidden amongst the trees within the Garden. For main course and dessert, you'll join us on the Cottage Lawn in the heart of the Garden, on a family-style sharing table for a open-air feast cooked over fire. on the day of the event for you to enjoy. as well as entry to the Sculpture Garden. Tickets are very limited in number - book early to avoid disappointment! but for other enquires please do pop us an email. For further drinks after the Welcome Drink, it's BYOB. Water will be served on the tables. As with all The Salt Box's supper clubs, you'll be seated with fellow diners on sharing tables. Don't worry, we'll make sure you're with all your pals, and you might even leave with some new ones! To encourage conviviality, a number of the dishes are designed for sharing and will be put in the centre of your tables. The Salt Box will have limited capability to cater for dietary requirements without advance warning, due to the set menu nature of the event, so please let them know about anything relevant prior to booking your tickets. Find out more about The Salt Box at http://www.wearethesaltbox.co.uk, or follow them on Social Media using @thesaltboxuk. Nestled in the hills in Northern Provence lies a special garden unlike any other. Sensitively landscaped, developed and nurtured by landscape architect Anthony Paul and owner Tony Stone over the past twenty years, the gardens at La Jerigriere are not only home to stunning landscaping, plants and trees, but also to a stunning collection of contemporary sculpture. The newest of these is also the largest, and most dramatic. A fan of wood carver artist Walter Bailey, Tony Stone already has a number of his fantastic pieces purchased from The Hannah Peschar Sculpture Garden carefully placed throughout his gardens. But in 2017, when an area of the garden was looking to be developed further, Tony Stone wanted to up the ante. Instead of selecting a ready made piece to place, Stone commissioned Walter to come up with something spectacular to add a real sense of drama. After a year of plans, drawings and carving, Walter Bailey and his wife Deborah, along with Anthony Paul and gallery manager Vikki traveled back to Provence to install this magnificent piece. Focusing on rows of grasses forming a point, Walter’s concept of celestial arrows plays with perspective, scale and shadow. Carved from yew for strength and English redwood for grain and contrast, these towering forms stand over 3 metres tall. Gently moving in the wind, one would be forgiven for thinking that they had indeed just plummeted to earth. Originally titled ‘Arrival from the living cosmos’, Bailey changed the title after hearing Tony Stone remark “Today five arrows from another galaxy struck my garden’ - a levity we all enjoyed. 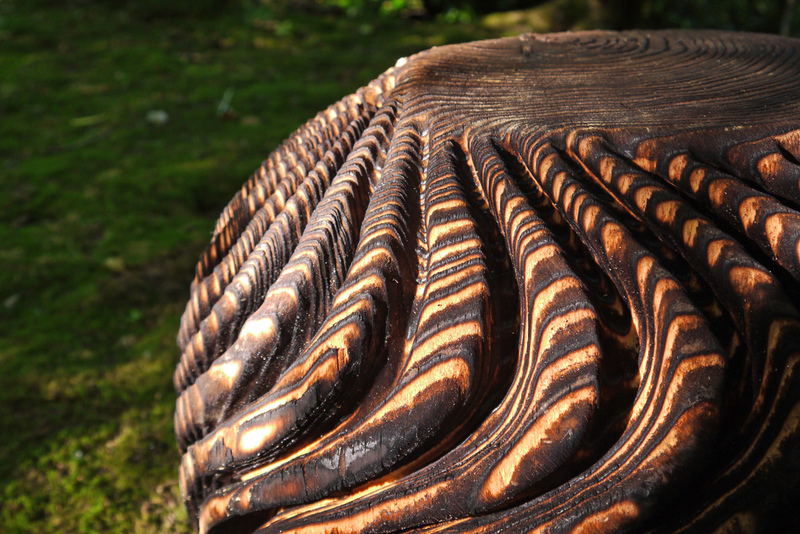 Bailey’s iconic swirls and spirals discuss the rhythms of nature and the universe. The scorching of the wood is not just for aesthetics - it seals the wood and adds longevity compared to leaving it natural. Bailey brushes back raised areas to draw out the grain and create the beautiful contrast on the surface of the sculpture. A truly one of a kind sculpture for a one of a kind setting. Yes, it may still feel like it's winter - but we are now OPEN for the 2018 season. With ten new artists showing alongside previous exhibitors, this years exhibition is shaping up to be something very special. From strange installations, to gentle figures, from towering forms to minute detail - there is something for everyone. Spring flowers are creeping their way to the surface - swathes of wood anemone, fritillaria, primula and bluebells to come - sping is the most colourful time of year in the Sculpture Garden. Open 30th March to 28th October 2018. Sadly it is still very muddy and wet, so please wear sensible footwear (wellies or walking boots are strongly advised). Aside from a stunning carpet of wild flowers in the spring, autumn is certainly the most colourful time of year in this otherwise green environment. Warm hues bath the garden in a gentle glow: rich reds, fiery oranges and golden yellows transform the sculptures, drawing attention to different colours and textures found within. It is remarkable how much the surroundings can alter the appearance of a piece - one of countless reasons why exhibiting art in the outdoors is such an exciting journey throughout the seasons. 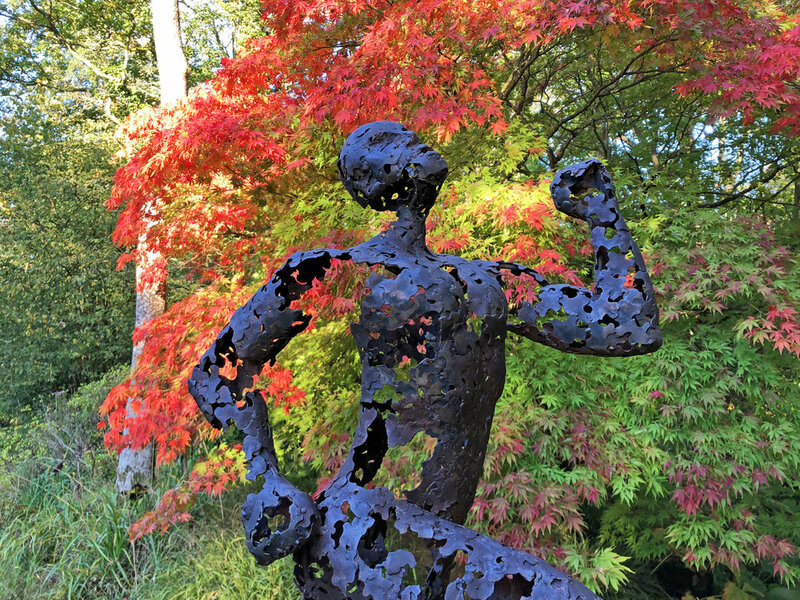 Every day is different: as the leaves and light changes, so does the way the sculptures work with their surroundings. The Sculpture Garden will be closing for the winter on Sunday 29th October - don't miss out on this year's fantastic exhibition! If you visited the Sculpture Garden during July, you may well have encountered our artist in residence Anna Garrett nestled amongst the magnificent Gunnera Manicata that grows throughout the gardens. "Anna Garrett is a painter and mixed media artist, currently completing her Masters in Fine Art at Goldsmiths, University of London. Spending a series of days within the heart of the garden, surrounded by the overwhelming plants of gunnera, petasites and hogweed: it is the emotion and feeling of being dwarfed by nature that will most inform the artist’s residency at Hannah Peschar Sculpture Garden. " Anna’s interest lies in the power of nature, beautiful yet brutal, and has evolved into an interest in the seductive monumentality of the plants. Anna’s recent research includes an exploration into the ‘otherness’ of nature and femininity, the relationship between colour and the feminine, and moreover, how nature, colour and the feminine are connected. Her practice evaluates the materiality of a painting’s structure is at its core, and considers the abjectivity and seductivity of paint as a medium, particularly within a fluorescent colour palette. The residency culminated into a large scale painting, playing with an unsettling duality. The neon paint gives way to monstrous forms and a seductivity into the heart of darkness within the plants’world. This painting - a first for the Sculpture Garden - is on display in the Wood Barn, located in the woodland from 5th August until 29th October. A rare opportunity to explore the Sculpture Garden at dusk, when warm light and long shadows add a new layer of mystery and intrigue. 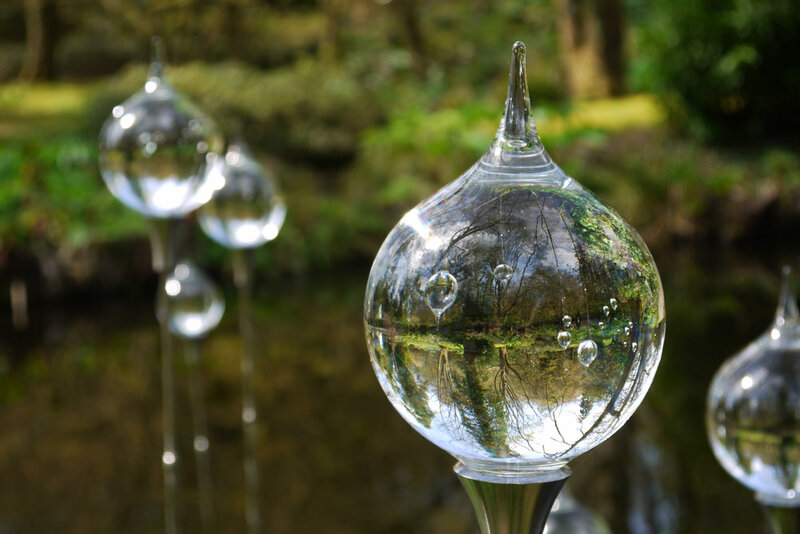 Mirrored surfaces glistening in the setting sun, neon light installations leaping out from the foliage, sparkling sculpture dancing on the ponds…..the Garden comes alive as the sun goes down. Join us from 6.30pm on Saturday 5th August, when co-owner and world renowned landscape designer Anthony Paul will give a short talk about the Garden itself, the history and the art on display. Mr. Paul will then introduce exhibiting stone carver Lucy Unwin, who’s work has become a firm favourite in the Garden since first exhibiting with us in 2016. A relatively young artist, Unwin is a talented sculptor - capturing tender and delicate details on unusual stone sourced from across the globe. Miss Unwin will give a short talk about her work and process. Prosecco and soft drinks will be served, along side a light buffet of hot and cold nibbles. Guests are welcome to explore the Sculpture Garden after listening to the talks, or if one prefers may begin the walk straight away. Anthony Paul, Hannah Peschar, sculptor Lucy Unwin and curator Vikki Leedham will be available for questions, discussions or general musings throughout the evening. Please note that not all areas of the Sculpture Garden are fully accessible for less able visitors. Please contact us to discuss any concerns. Anna Garrett is a painter and mixed media artist, currently completing her Masters in Fine Art at Goldsmiths, University of London. Spending a series of days within the heart of the garden, surrounded by the overwhelming plants of gunnera, petasites and hogweed: it is the emotion and feeling of being dwarfed by nature that will most inform the artist’s residency at Hannah Peschar Sculpture Garden. The residency will culminate into a body of large scale paintings, playing with an unsettling duality. The neon paint gives way to monstrous forms and a seductivity into the heart of darkness within the plants’ world. Pretty Monstrous: paintings and observational drawings will be on display during Hannah Peschar Sculpture Garden’s ‘Celebration of Art and Nature’, Saturday 5th August 2017. June’s dramatic heatwave was certainly a bit of a shock for the UK, but here in the sheltered valley of the Sculpture Garden we seemed to escape the worst of it. May and June is a spectacular time for the plants - our Gunera Manicata, Petasites and Hogweeds really do take on a life of their own and we can visibly see the growth each day. Enormous leaves reaching high into the sky, dwarfing even our largest sculptures - you’d be forgiven for thinking that you’d been transported to some distant land or mystical paradise. New sculptures have continued to make their way into the Sculpture Garden over the past two months - we are now proudly exhibiting well over 200 pieces by 51 different artists. We’ve hosted a number of wonderful school groups, art, photography and gardening clubs, and even a proposal! If you’re looking for a bit of inspiration, pick up a copy of July’s English Garden magazine where you can read a five page interview with Hannah, discussing the best ways to chose and site sculpture in your own garden. It wouldn’t be complete without lots of beautiful photos of pieces both past and present from the collections here! These are a few recent highlights currently on display…..
We are now officially open for the 2017 season! April has blessed us with incredible weather, allowing all the sculpture to be installed without too many problems. We are on clay here, so we split installation into two groups - the smaller and lighter pieces coming in March, and the larger/heavier pieces coming in Mid April. This means that should March be very wet, we won't be causing too much damage to the Garden itself. This year's show features 10 new artists, whom have never exhibited with us before. These include some very unusual materials and techniques, which have brought a new feel to the Sculpture Garden. 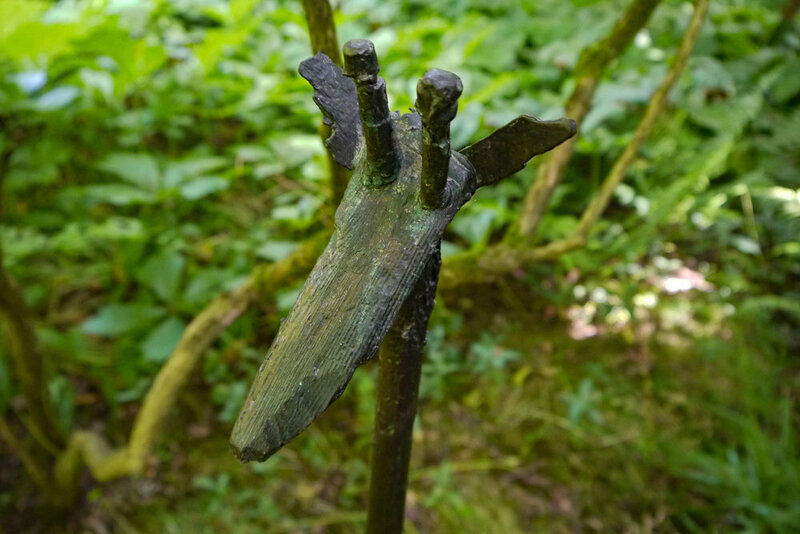 You will be sure to find old favourites throughout the Garden - sculptors who have exhibited and supported us through the years. The Garden itself is already looking beautiful - we have been very spoilt with carpets of wild spring flowers throughout the month. We are open throughout the spring, summer and autumn until Sunday 29th October. Opening times can be found here. The final pieces were placed Friday 21st April - so our Garden Guide is *at last* complete. Please do get in touch if you would like to receive a copy. Autumn is always a rather quite time here at the Sculpture Garden, aside from clearing up the cascades of falling leaves that carpet the garden in a riot of colour. This year, however, we are proud to be hosting a temporary installation by a group of second year Fine Art students from UCA in Farnham. Our curator Vikki undertook some of her artistic training at the university, so we are thrilled to be able to help with their exciting project. The installation is the very definition of temporary - the entire piece will be constructed, documented and dismantled in ONE (hopefully sunny) day in December. ‘Kitchen Flux’ is a pop-up exhibition housed in a free standing kitchen - all outdoors, and will be livestreamed online for viewers all across the world to enjoy. - Please note that this installation is only viewable ONLINE - visitors on the day will not be permitted. Scale plays an important factor in Bailey’s new work; towering ‘The Sheltering Stack’ reaches over 5 metres up into the sky, matched only in stature by the mature trees and Gunnera Manicata growing along side. Central to the collection is the title piece - ‘The Sheltering Earth’. Created from over 100 individually carved elements, Bailey meticulously arranged the squares to form a dome that entices the viewer to crawl inside. Gazing upwards, viewers experience framed glimpses of the world above - tree tops, clouds and soaring birds are visible from inside the safety of the shelter. “'The Sheltering Earth' explores the fragility of shelter; recognising that the living Earth and our humanity is our only true shelter.” - Walter Bailey. 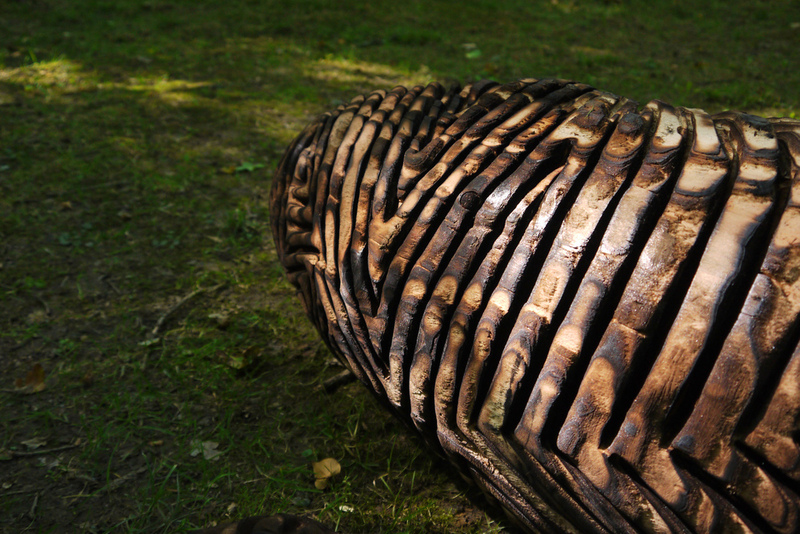 Over a dozen new pieces by Walter Bailey are now on display at the Sculpture Garden, alongside the Summer Exhibition. ARTIST IN RESIDENCE 29th June to 3rd July 2016. 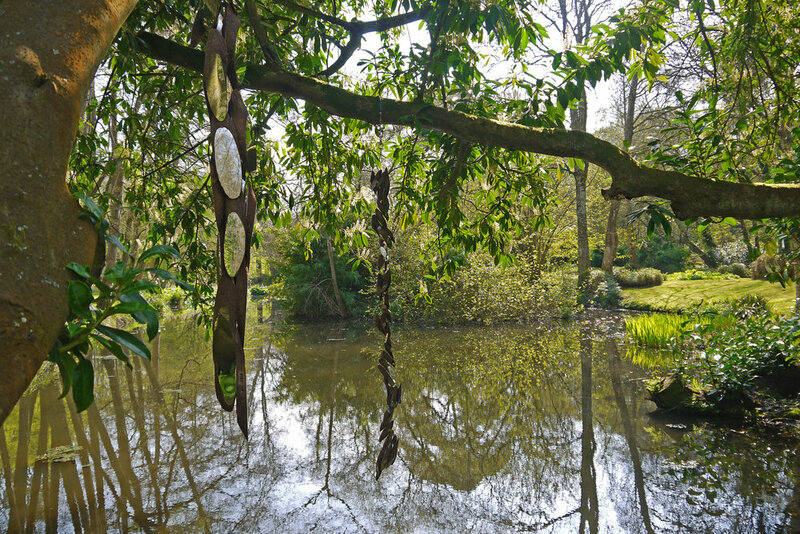 Section of 'Weeping Willow' - willow and mirror-finished stainless steel. We are thrilled to announce that Lee Borthwick will be our artist in residence at the end of June. Lee will be making new work using wood from out own trees here in the Sculpture Garden - potentially on a larger scale than she's ever done before. "Each piece of wood I collect has a narrative and a past, each piece of work therefore rendered unique. Through an array of sustainable and local sourcing techniques and, well, having developed a reputation as a bit of a log lady…. I have a wonderful selection of branches and logs in the workshop…"
How is it already approaching the end of May? The time has certainly flown by over the past few weeks. The Summer Exhibition is now fully installed, and the Garden itself is truly flourishing. The bizarre weather over the past few weeks has certainly done wonders for the plantlife - the soil temperature is up, and all the rain means they are rather perky and happy. We, on the other hand, would be perkier if it could stop raining over the weekends! We could not be prouder of this year's exhibition. We've really gone back to our roots (forgive the pun), and focused on the relationship between nature and art. Curating the exhibition took far longer than usual due to the extra thought and consideration with every single placement, but we truly believe it was worth it. This year you will find sculptures in the most unusual settings; appearing to grow from the undergrowth, hiding under trees, and nestled amongst the architectural planting. We've also had fun with scale this year - from an entire cityscape that could fit on a pizza, to a shooting plant that dwarfs even the most giant of our Giant Hogweed. It's the week after the May Bank Holiday weekend, which can only mean one thing - we are officially open for the summer. The Gardens are truly springing to life - the warm weather has stirred the Gunnera and Hogweeds from their winter slumber, and everyday we can visibly see their progress. Trees are blossoming, the Bluebells are in their full vivid glory, and everywhere we look new shoots are pushing their way through. The resident feathered-wildlife has also come to life, with families of ducklings and moorhens paddling about happily on the ponds. Most importantly, our Summer Exhibition is almost fully installed (there will be additional pieces later in the summer, but more on that later) and we could not be more pleased. The 2016 show is our biggest to date, and the addition of a number of indoor pieces in the gallery reception has really made this exhibition come together. Our key aim over the installation period was to make sure that every single placement was carefully considered so that the relationship between art and nature is reinforced at every turn. This year we are opening from Friday 1st April. That's right, APRIL. No April Fool's joke, we promise! 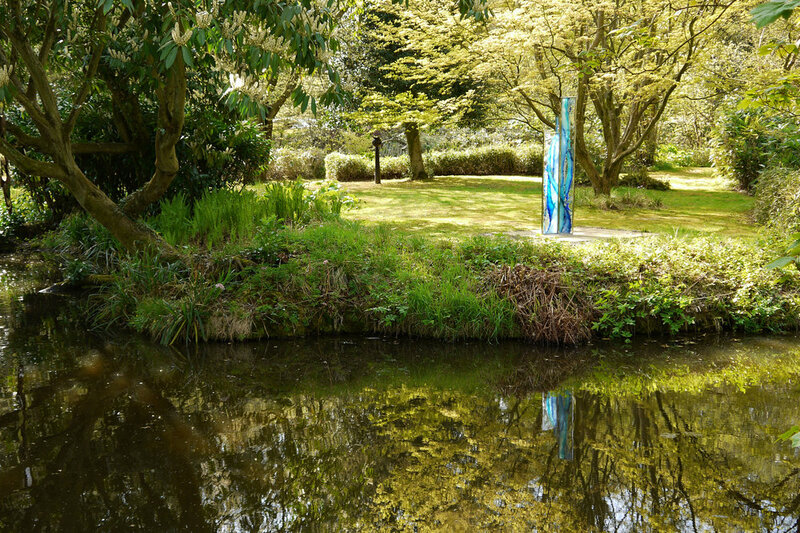 From Friday 1st April, you will be able to visit the Sculpture Garden on Thursday to Saturday 11am until 6pm, and Sunday (and Bank Holiday Monday) 2pm - 5pm. Yes, you read that right too - we are opening on THURSDAYS through to Sundays. So there's no excuse not to come! Our summer exhibition will be installed throughout April, so you might even see your favourite artist placing his/her new work. There will be less work on display at the start of April but the spring flowers are always stunning, and worth a visit in their own right. So, to summarise: open 1st April* and open Thursdays. *Being April, it will probably rain. Please come prepared, and feel free to check with us first before coming.